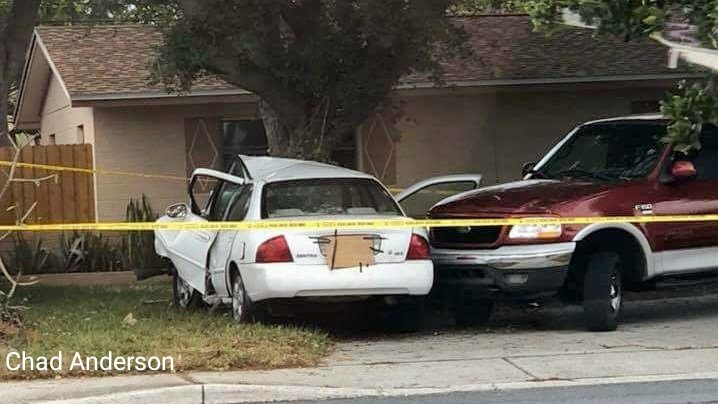 Pinellas County Sheriff’s Office Deputies assigned to the Major Accident Investigation Team are investigating a fatal single vehicle crash in Seminole. The crash occurred at approximately 4:17 p.m. on Friday, March 30, 2018. According to investigators, 76-year-old James Moriarty Jr. was driving his 2006 Nissan Sentra eastbound on Park Boulevard when he drove over the raised concrete median barrier. The Nissan then went into the oncoming westbound lanes of Park Boulevard. The Nissan drove up onto the curb and sidewalk along the right westbound lane of Park Boulevard. The Nissan then drove through a private residential yard before striking a mailbox then drove through second yard and struck two fences. After striking the third and final fence, the Nissan struck a large tree head-on causing the back end of the vehicle to spin counter-clockwise. The counter-clockwise motion caused the Nissan to strike a parked unoccupied Ford F-150 that was parked in a driveway of private residence located at 11635 Park Boulevard, Seminole. Paramedics responded to the scene and transported James to Largo Medical Center Main Campus where he was pronounced deceased shortly thereafter. Investigators say James possibly suffered a medical episode which may have led to the crash.